Electric scooters have come to make commuting even more interesting and hassle free. Unlike the kick scooters, these models are more of electric cars only that they are less pricey, are of a compact design and are highly portable. Besides offering a way to evade the constant traffic jams, electric scooters also offer a responsible way of moving around with zero emissions. Electric scooter comes in different sizes and models. 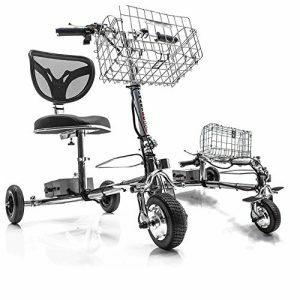 There are those designed for kids, adults and others designed for people who would like some assistance with their mobility. Unlike a few years back, today’s scooters are loaded with numerous features to make your rides more enjoyable. Most of them run on rechargeable batteries and motors. Some are known to be super fast with up to 30 kph. The best thing about scooters is that you don’t need a driving license to ride on them. However, you also require some training to ensure your safety on the road. From the numerous electric scooters on the market today, these are amongst the best trending electric scooters. Most scooters are designed to work well on pavements. But you can now take the fun off-road where gravel lives thanks to the high torque and stability with this scooter. At a glance, you’ll tell that this scooter is durable and a high performer. It has a wide deck with a non-slippery tape and soft rubberized handles for sturdy grips. This scooter uses a 24V rechargeable lead-acid battery that can speed the motor up to 19 kph for 40 continuous-use minutes. The full recharge of the battery is 12 hours. Pulse Performance is by far one of the most advanced units in the world of scooters. This electric scooter features a serious design putting all your fun and safety needs into consideration. Its 100-watts motor is here to take you up to 10 mph. This scooter has a 24V rechargeable battery that lasts for 40 minutes with each charge. Pulse Performance electric scooter has a twist throttle on its one handle and a conveniently positioned brake on the other handle. The frame is of tubular steel that makes it super light to carry. It has durable polyurethane tires that mostly need no maintenance. This is among the reasonable electric scooters we have on the market today. 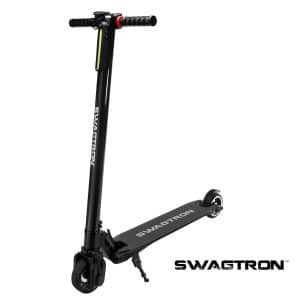 Swagtron electric scooter comes in 3 colors; white, black, and pink. It has a strong steel frame and sturdily constructed wheels to support up to 250 lbs. battery recharges in 1.5 hours and should take you for between 5 to 15 miles. Again, it’s incredibly easy to operate and therefore has fewer accidents. Amongst its unique features are a speedometer and odometer. This electric scooter has removable handles and folds in a snap for easy portability or storage. Moreover, it’s TSA certified so you can have it with you on your holidays or trips. The battery recharges for only 1.5 hours and should take you for between 5 to 15 miles. Amongst its unique features are a speedometer and odometer. This electric scooter has removable handles and folds in a snap for easy portability and storage. Moreover, it’s TSA certified so that it is allowed on board and you can have fun with it on a trip. E-Twow is taking the electric scooter to an entirely new level with their out-of-this-world scooter. Its thoughtful design makes it super light to take it with you almost anywhere through office lobbies, bus and train terminals, and even in the airline. It’s easily foldable so you never run out of storage ideas. This scooter cruises with the high speed of 30 km/h. For safety purpose, it is also equipped with a LED display so that you can ride during nighttime. The scooter is also backed by a 2-year warranty. 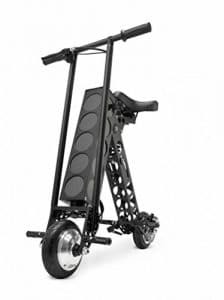 Glion dolly foldable electric scooter is one irresistible electric scooter you should have by now. This scooter is powered by 36V lithium-ion battery that needs for full charge of around 3.5h and it can operate up to 15 miles per single charge. It’s fitted with a 250-watt motor at the rear wheel with no chains or gear. This makes it not only fast (with the speed of 15 mph), but also incredibly quiet. 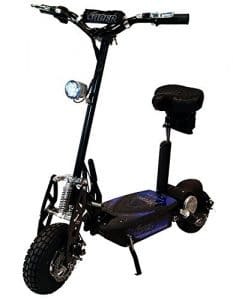 Additionally, this scooter is doubtlessly durable as it’s made from aircraft-grade aluminum with a solid powder coating to make it anti-corrosive. Its speed controls are fitted in both the right and left handle. 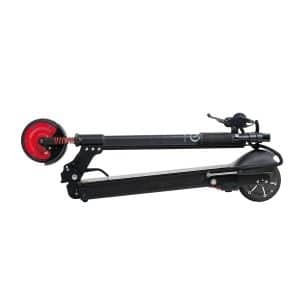 For compact storage purpose, the dolly electric scooter can be folded as vertical self-standing. It also comes with a scooter cover, pedestrian bell and a LED display to alert you on the battery charge remaining. If you need a fast, practical, and durable scooter, you can’t be wrong with this Eco Reco M5 E-Scooter. Its battery charges super fast and can be recharged for over 2000 times. It has a wide foot area to offer you all the stability and comfort you need. Eco Reco has sturdy hard tires that will never get flat no matter the terrain. With the top speed of 20 mph, Eco Reco M5 has sturdy hard tires that will prevent from the flat tire. It is fitted with a LED display that shows the speed and the battery life. Additionally, this scooter has rear brakes for safe stops. It can be folded easily for compact storage and portability. The full battery charge of the scooter is quite long as it needs 4.5 hr for the full charge. 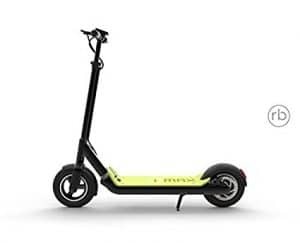 IMAX S1 electric scooter offers one of the most practical scooters to whizz in town with absolutely no gas emissions. One of its outstanding features is its 10’’ inflatable wheels, they make it easy to scoot on almost any terrain since they absorb any shock. 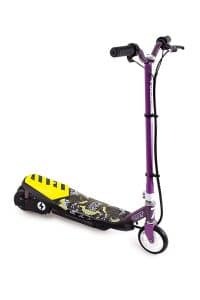 They have a durable 48V lithium-ion battery that will offer you a flawless ride for at least 3 hours with each charge. Again, the battery charges faster so you’ll be on the road most of the time. Moreover, Imax S1 has ergonomically designed rubberized handles for a secure comfortable grip and a bright LCD light for night strolls. The durable 48V lithium-ion battery that will offer you a flawless 15 to 20 miles ride for at least 3 hours with each charge. Moreover, Imax S1 has ergonomically designed rubberized handles for a secure comfortable grip and a bright LCD light for night strolls. Smart Scoot electric scooter is one of the best ways to scoot in style and elegance. 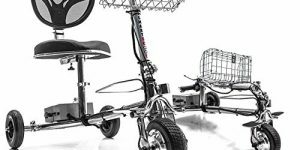 This electric scooter features stainless steel construction for its entire frame which makes it lightweight and rustproof. The big rubber wheels, 8 inches for the front and 7 inches for the rear wheels make the scooter smooth and durable while riding. It has both forward and reverse modes and comes with 3-speed settings (low, medium and high). Smart Scoot is powered by the lithium-ion battery that holds for 12 miles for a single charge. It’s easily foldable design scooter that you practically need no tool or help from anyone to fold it. Its comfortable seat with a back support comes in handy especially to those who need some mobility assistance (highly recommend for elderly). The scooter is also equipped with a front basket and a LED headlight for safety travel. 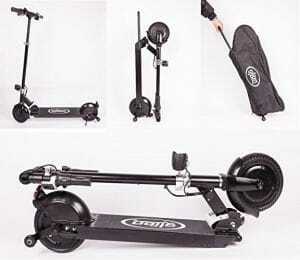 Black Super Turbo electric scooter is loaded with extremely great features to make your stroll fun. It has big inflatable tires to enable you navigate through any type of road. The electric scooter comes with 1000 watt motor aims at giving the highest speed of 26 mph and the 36V battery that’ll give you an 18-miles ride per charge. Additionally, it’s fitted with front and rear shock absorbers to give you a smooth ride. Lightweight, portable and powerful is what you would describe this URB-E electric scooter. URB-E scooter is originally designed and assembled in America. Its most notable feature is that it’s strong having being crafted from light but strong aircraft-grade aluminum and carbon fiber. 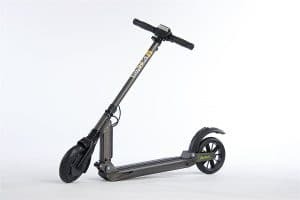 The URB-E scooter has been designed to offer extreme stability ride at its 15mph speed for 20 miles range with the full charge of 4 hours. Around 50.8 pounds in weight, URB-E scooter is extremely compact and much lighter than other scooters on the market. It folds easily to fit into almost any truck, SUV, van, boat, and also in the airline. Uniquely, this scooter features a cup holder, smartphone holder and charger, a torch, etc. Owning a scooter is one of the best ways to evade the congestion in the trains or buses. It’s also fun and enjoyable being on them. Though some of them come at extremely high prices, they provide incredibly great performance with the high-quality they obtain.